XBoft Data Recovery can easily recover lost files, pictures, documents, videos and more from deleting, formatting, partition loss, OS crash, virus attack and other data loss cases. It guides you to find out lost files precisely and recover from PC, laptop, hard drive, SSD, USB, memory card, digital camera, etc. until you get all lost data back again. Quickly recover data from unexpected lost caused by accidentally deletion or affected by virus attack. Data deleted from the recycle bin is not a permanent hurt. If you regret your decision, XBoft Data recovery software help you in an effective way. Formatting a disk does not erase the data on the disk, only the data on the address tables. You still have a big chance to retrieve formatted data. Even if your whole partition is missing or cannot be recognized by system, your data is still recoverable. When a hard drive is corrupted, it become inaccessible. 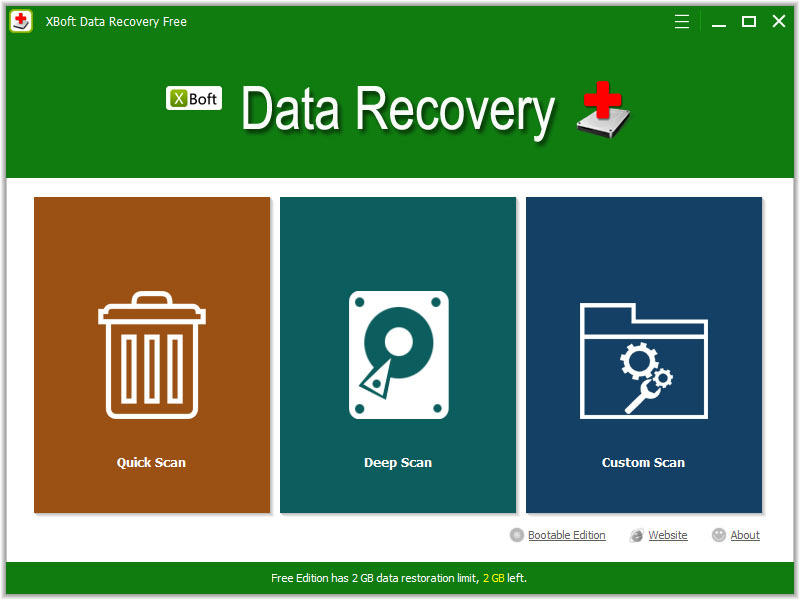 XBoft data recovery for free allows users to find data back. Hard disk or partition suddenly become RAW and cannot access the stored data, You can directly free download the best data recovery software.